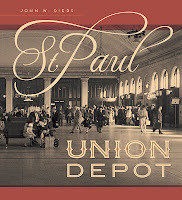 UMP | University of Minnesota Press Blog: Mixed enthusiasm, fast growth: The early history of the St. Paul Union Depot. Mixed enthusiasm, fast growth: The early history of the St. Paul Union Depot. The St. Paul Union Depot was among the busiest and best-known places in the city—one of the largest depots in the nation and St. Paul's link to the world. Here, John W. Diers, author of St. Paul Union Depot, recounts a piece of that history, illustrated with images that appear in the book. Look to this space on occasional Mondays in May for more of St. Paul Union Depot's story. Designed by local architect Leroy S. Buffington, St. Paul's first union depot opened in 1881. It replaced the four separate stations then used by the railroads serving the city. The building was claimed by fire in 1913. Why a union depot company? Railroad depots came in many different shapes and sizes, from a simple shelter to Penn Station in all of its magnificence. Most were owned and operated by the railroad that used them, but in some instances several railroads serving a town or city came together and formed a union depot company to own and operate a single passenger station. Such was the case in St. Paul. The 1878 edition of the Official Guide found seven railroads and thirty-eight daily passenger trains arriving and departing from four depots crowded on, or near, the Mississippi levee. None of these stations were adequate for the hundreds of people passing through them every day, not to mention the volume of baggage, mail, and express that had to be loaded and unloaded or carted from one station to another. Railroad managements at the time foresaw that a growth in traffic was inevitable once the Northern Pacific competed its line to the Pacific coast and the St. Paul & Pacific built into the Red River Valley and the Canadian border. St. Paul city fathers were enthusiastic about railroads and encouraged their development, helping to sell bonds to promote construction and giving away land to build warehouse buildings and elevators on the levee where railroads and steamboats could exchange traffic. There were around 20,000 people in St. Paul in 1870 (up from 10,000 in 1860). By 1872, St. Paul had its first horse-car line running from Lowertown to Seven Corners. The city was spreading beyond the river, reaching west toward what would be the Midway District. The need was obvious but the solution less so. There were disputes among the seven railroads over ownership and access to terminal facilities. Should it be a union depot company, or should one railroad own the depot with the other railroads as tenant in a joint facility arrangement? 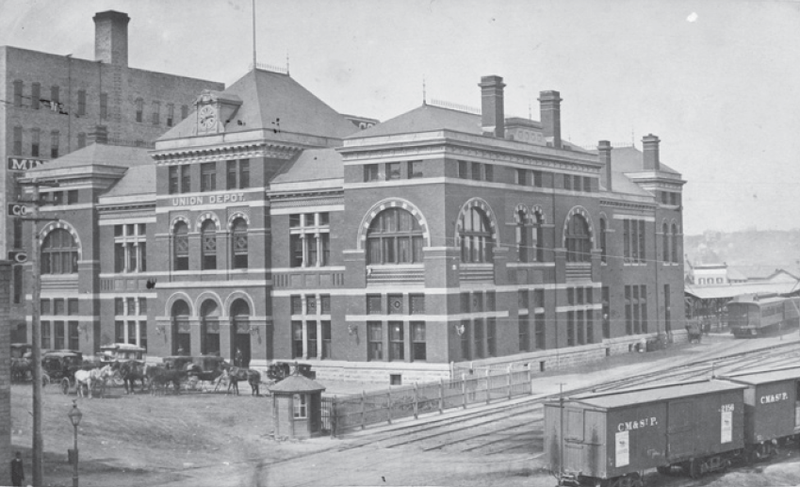 James J. Hill’s St. Paul & Pacific preferred a joint facility arrangement with it as the owner and the other railroads as tenants, but the other railroads wanted a union depot company and their interests prevailed. Thus, on January 24, 1879, all of the general managers of the railroads serving St. Paul signed the articles of incorporation of the St. Paul Union Depot Company and set its capital stock at $250,000. Six months later Alpheus B. Stickney was elected its first president. The Union Depot Company was wholly owned by the railroads, each of them subscribing to shares of its capital stock and holding a seat on its board of directors. The board elected officers from among its members with the presidency rotated from one year to the next. The officers hired the depot managers. An operating agreement among the owning companies governed day-to-day operations and how the costs of these operations were apportioned. With some modifications this agreement would define the relationships among the owning railroads for the life of the depot company and the three depots that were eventually constructed on the site. 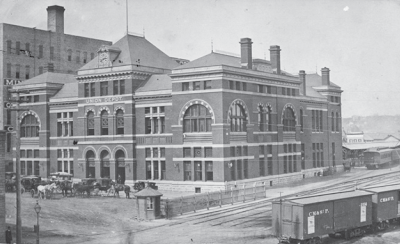 The first union depot was completed and opened for business on August 21, 1881, beginning a history that would last almost 90 years until the evening of April 30, 1971, when the final passenger train departed St. Paul, and Amtrak took over what remained of the nation’s intercity passenger trains. With no trains and no business, the St. Paul Union Depot Company was dissolved. The union depot's 1889 train shed under construction. Train sheds were a hallmark of 19th-century railroad depots. 1879 found mixed enthusiasm for a new union depot on St. Paul’s Mississippi levee. The location was subject to flooding and soil conditions were not the best. Historically the area had been a bog. Much fill would be required and track approaches would have to be built on pilings, problems that would never completely go away. But more important, there was intense opposition from steamboat interests who contended a depot at the levee would obstruct access to the riverfront. When the railroads, forever seeking the easiest grade, followed the river into St. Paul they, too, occupied the levee. It was close to the commercial center of St. Paul and offered a good connection with the steamboats. However, there wasn’t enough room for both, and as railroad traffic increased, steamboat interests came under increasing pressure to yield to the railroads. The steamboat interests filed suit. When the lawsuit failed, the railroads moved quickly to begin construction. Prominent local architect L. S. Buffington was hired to design the building. Work began on June 1, 1880, but a year was consumed improving the site. Built at a cost of $250,000, the depot building, associated yards, roundhouse and locomotive coaling and watering facilities covered nine and one-half acres. The complex could accommodate seventy-five trains a day, a number that soon proved grossly inadequate. It would take some forty years to make the correction, and by then the passenger train was in decline. But in 1882 it was about manifest destiny, the pending completion of the Northern Pacific’s line to the Pacific, and the sure and inevitable growth in passenger and freight traffic to follow as thousands of immigrants passed through St. Paul and the depot on their way to settle the Dakotas, Montana, and the Pacific Northwest. 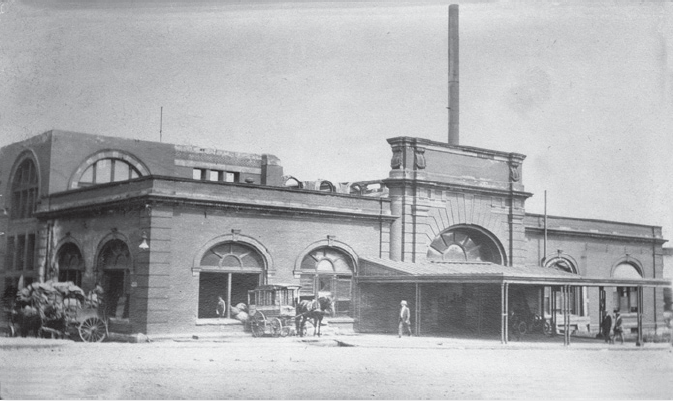 Shortly after midnight on June 11, 1884, a fire started in the depot’s restaurant kitchen. It spread quickly. The entire building burned to the ground. It was a disaster, but the railroads responded and a new, somewhat larger, depot opened in the fall of 1884. There would be other improvements. 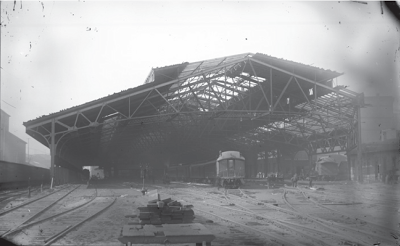 A huge, 120,960-square-foot train shed, covering all nine tracks and five boarding platforms, was constructed in 1889. Other additions were made in 1900–1903, but they failed to meet passenger demand. Between 1889 and 1910, passenger traffic doubled. Five railroads joined the depot company, others merged, and three completed lines to the Pacific, essentially completing the network of rail lines entering St. Paul Union Depot. The depot’s greatest test came in the summer of 1896 with the annual encampment of the Grand Army of the Republic, a fraternal organization of Union Army Veterans. The depot and the railroads serving St. Paul had never seen such crowds. Between August 31 and September 5, 1896, 1,172 trains and 8,074 passenger and baggage cars brought 200,000 people through the depot. 29,309 passenger trains used the depot in 1898, and 37,599 in 1899—an increase of 28 percent. of the building would be demolished. The depot had run out of capacity and a new facility was needed, but there was no consensus among the owning railroads, or city fathers, as to the location, size, and cost of a new depot. Individually, the railroads were in favor of a grand new station, but collectively there was no agreement. The controversy dragged on for more than ten years, but on the night of October 3, 1913, the old depot was destroyed by fire. A decision was forced upon them. For the next part of the story, check this space on May 20. John W. Diers, author of St. Paul Union Depot, has worked in management in the transit industry for thirty-five years, including twenty-five years at the Twin Cities Metropolitan Transit Commission, where he started as a bus driver–dispatcher, then moved on to administrative assistant to the general manager, division superintendent, chief of radio communications, and manager of maintenance administration. He also worked with ATE Management and Services as general manager of the transit system in Racine, Wisconsin. He is now an independent consultant on transit operations and a writer and researcher on transportation history. He has written for Trains magazine and is coauthor, with Aaron Isaacs, of Twin Cities by Trolley: The Streetcar Era in Minneapolis and St. Paul (Minnesota, 2007). He has served on the board of the Minnesota Transportation Museum and on the editorial board of the Ramsey County Historical Society. He is president of the Scott County (Minnesota) Historical Society. "The story of the Union Depot is St. Paul’s story. By chronicling the history of this magnificent building from the vantage point of its current renewal, John Diers gives us an insight into how we became the city we are today." "The Union Depot was the heart of St. Paul in its glory days when the railroad was king. John Diers captures the energy and excitement of that era, but his narrative tells a larger story as well—an American story of creative destruction, progress, and its costs. 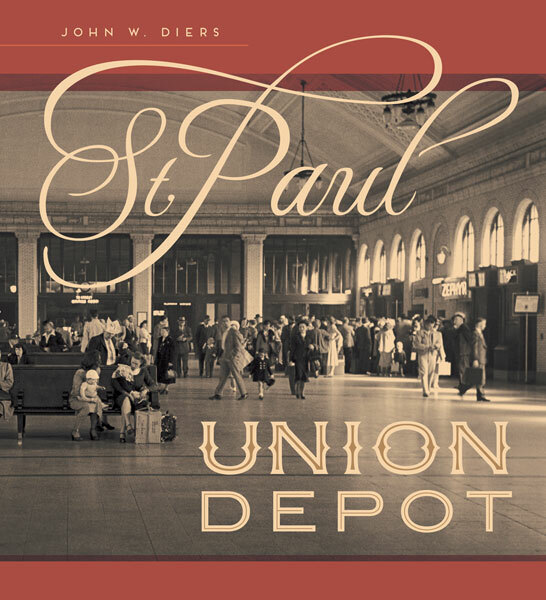 Meticulously researched and written, lavishly illustrated, and a delight to read, St. Paul Union Depot educates, captivates, and makes one yearn to hear again the echoing call, ‘now leaving on Track 7.’"
A tip of the hat to John Diers for preserving this important piece of history for us all.